Every so often, one of us would say how much the boys would like this while the other would nod, skip a stone or stare out at the sea. Inland was warmth and sunshine and days of summer stretching wearily. The coast, however, was 20 degrees cooler and worked in so many shades of gray. The sky fell into the sea and the waves rolled across my cold feet before running up the stairs to take their place at the end of the line. Clouds waited patiently. The rocks in the ocean were the size of ships, and ships were the size of small birds flying off in the distance. There was a cave on the beach and in it sat a family around a campfire. Their dog ran free and happy, a green ball held tightly in its mouth. My wife stopped mid-sentence, her words lost beneath the beat of a tide rolling in. I hadn't been listening. I was writing poems in my head as I am prone to do, and then promptly forgetting them, as that requires much less effort than actually writing them down. Most of them were rubbish, but one may have been damn near perfect. I watched her watch the ground. She was brilliant against the sepia shore. She bent down and picked a drop of red out of the surf-trodden sand. It was a ladybug, caked in grains and left for dead. Suddenly, the beach was alive with polka dots in reds and yellows, and the polka dots were, in turn, covered in dots of their own. We sat on our knees in the sand and dug ladybug after ladybug from their collective coastline grave. Our shoes, which had long ago left our feet and become something meaningless to hold on to, became the soles of rebirth. It was on the bottom of my left flip-flop that one ladybug found breath and another was once again able to crawl. 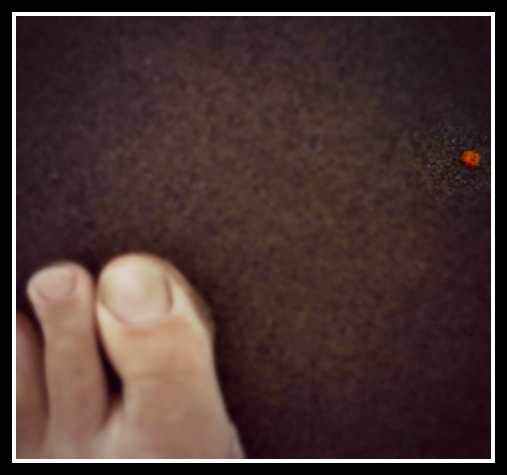 It was somewhere opposite where my big toe would be that a ladybug shook the sand from its wings and flew away home. It seems that they live in the trees that tremble from the side of steep ocean cliffs, and when certain winds blow the way that certain winds do, the ladybugs are pulled from whatever life they have known and dropped without warning over deep waters and hungry fish. Assuming they don't drown, are not eaten or lost at sea, they are marooned on beaches not 50 feet from the trees on which they started. But they are pounded with ebbs and flows, and they are forgotten amongst shells and bits of seaweed. All in all, it is no way to treat a lady. And so, we gathered those that we could and we carried them on flip-flops covered with newfound meaning to a piece of driftwood just below the tree line. The ladybugs wandered aimlessly and probably thought things about mortality and what to make of second chances. We wandered with slightly more purpose. Every so often, one of us would say how much the boys would like this while the other would nod, skip a stone or stare out at the sea. They were on a different beach, in a different state, looking over the same nothingness and the endless everything. Our day was a glass half-hollow, half-lined with romance. We played the percentages. Then we walked back across the beach, our shoes once again empty, our feet still cold and bare. We passed big rocks, small ships, a family around a fire and a dog with a ball and the constant need to wag. Our car was waiting for us, and beyond it a green forest, blue skies and something pretty on the radio. This post originally appeared on Honea Express.